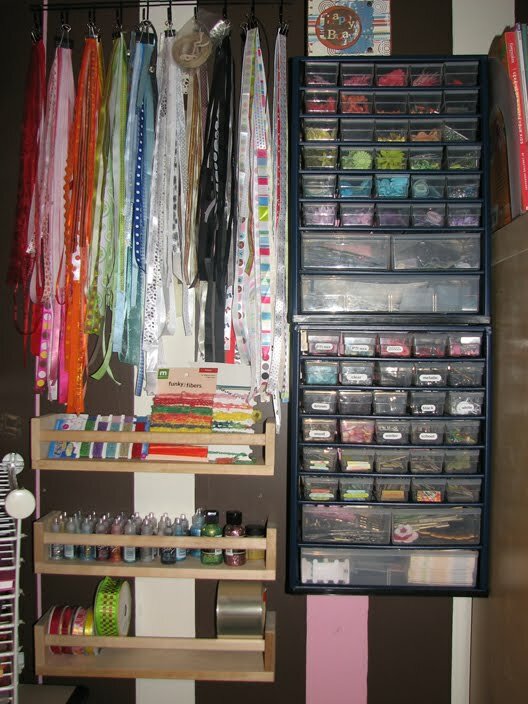 Taslimah made a video tutorial a while back to show how my ribbons look like before, and how organised after with the cropper hopper ribbon storage solution. Gretchen Barron has tons of tips on her blog but I found this one very interesting! She has stamped all of her greeting stamps onto "tags" and then ORGANIZED them by theme on rings so that she can SEE what greetings she has. Isn't this the coolest thing! Gretchen says "It's great to see all the different styles together and to be able to pick them easily, even setting them on the project to check size and position before I commit to a particular sentiment! " Click HERE to see her post about her greeting rings. Another room blows me away. You should really take a few minutes to see this wonderful remodeled garage turned craft space. I'm completely wowed. Cindy Stewart and husband remodeled their garage after a fire. She has a very well planned out space and countless storage ideas. Before sure to stop over to her blog for more photos. 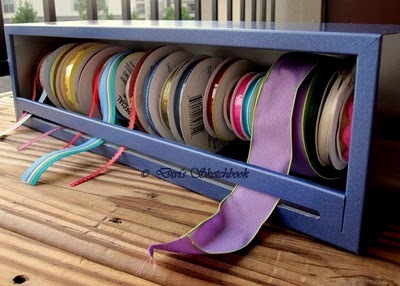 Divya designed and made this ribbon boxes. Aren't they great? Click here for more photos and info. This is pure genius. Click here for more info. I happened across a blog by Diana Gibbs looking for something else. When I saw the link to her studio space I just had to check it out. Di is a Stampin' Up! demonstrator who teaches classes as well as creates out of her space. 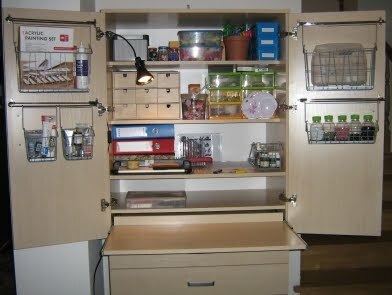 I was so impressed with how well organized she is - there is a place for everything and everything has it's place! I wish I was in Arizona - not just for some sun - but to take a class with Di and play in her studio! 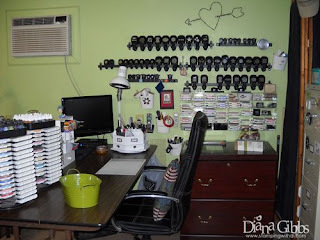 To see more of Di's Stamping Studio click HERE. Here's a view of my main workspace, my desk. 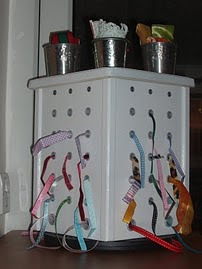 You'll notice my punches and ribbon are close at hand, and a peg board holds most of my tools within easy reach. I have a LOT of Ikea items in my crafts room. It's my go-to store for organization furniture and accessories! Another store I like to browse for storage options is my local hardware store. 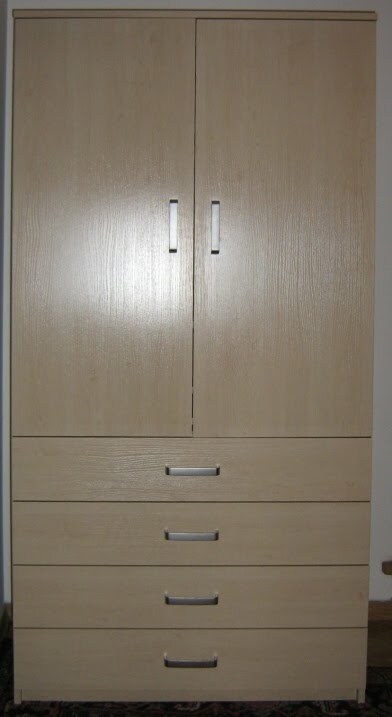 That's where I found the storage cabinets below (meant for garage storage of nails and such) that hold small embellishments such as brads, flowers, and eyelets. 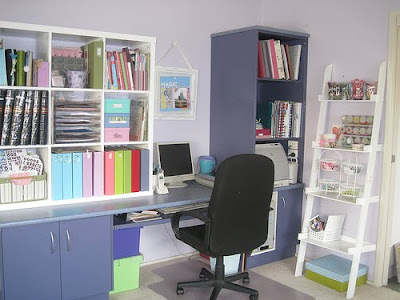 You can see more of my updated crafts room on my blog, including photos of my previous room(s). 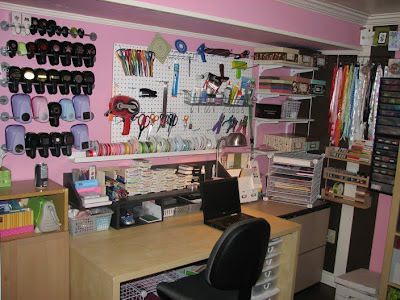 Do you have a fun and funky crafts room that you want to share? 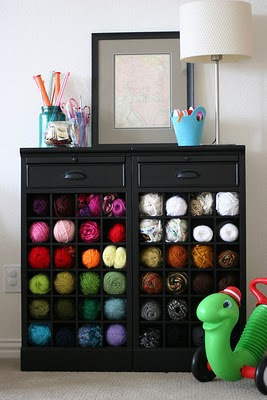 If so, please email the crafty storage team with a link to your blog, and you may just be the next featured crafter! Jane Egan-Cresswell is doing a creative clean up of her studio, posting very often about the progress. Click here to the main page of the blog. Kasia aka Kayla lives in Poland and she has been scrapbooking for about 3.5 years. Click here for more info, and here the main page of her blog. Petra is a big fan of making her own jewelry. 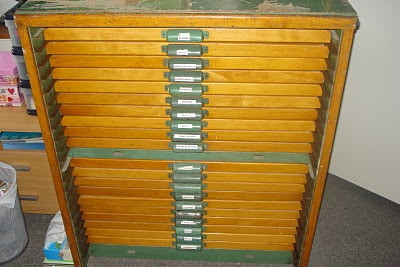 To store all her beads and findings Petra bought a bargain printing cabinet and converted into a beads cabinet. 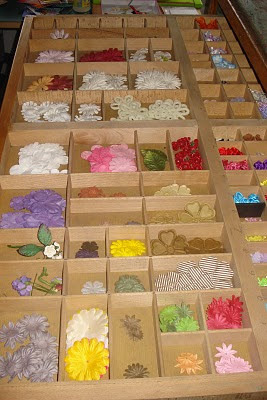 later on, Petra started to make cards and scrapbooking, and of course started to collect stuff and found its place in the cabinet. 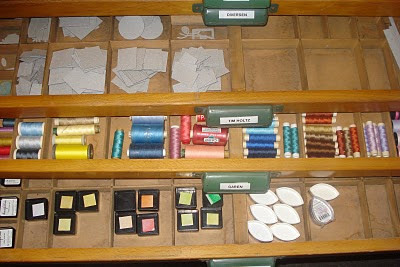 So in the upper part of the cabinet Petra has the card making stuff and in de lower part there are all the beads. Here's a slideshow of all of the pictures. for details on each photo you can go here. 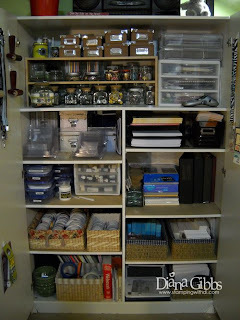 It's hard not to accumulate lots of "stuff" when you're into papercrafting! 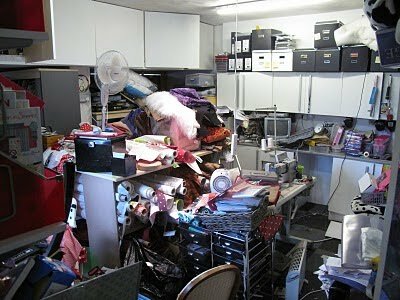 We all struggle with organization and that's probably why you're here - I know that's why I came to this blog. 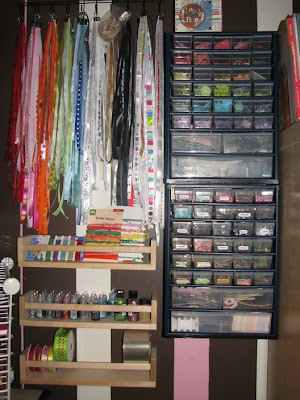 Today I want to show you Christine's craft room. Christine has been hard at work reorganizing her room and it's finally finished! 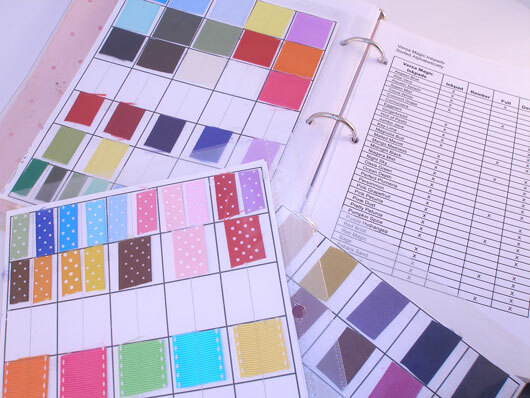 To reorganize your entire craft room is no easy feat! 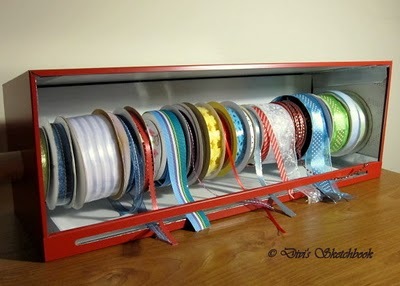 Christine followed the week by week organization challenges from Wookiemouse at My Love Affair with the Label Maker. For the first post in this challenge click HERE. To see more of Christine's finished room click HERE. To see her before photos click HERE. 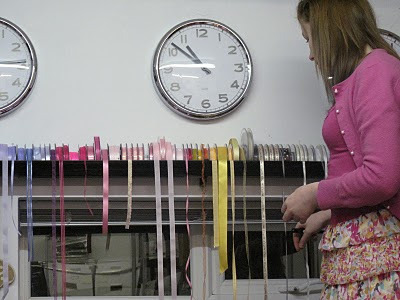 Grace at Amazing Paper Grace has a great idea to inventory her ribbon. Check out her post here. Leigh has several home made storage solutions that her husband made me, like the alcohol inks case bellow or the ribbon box above. Leigh's blog is dedicated to crafting on a low budget and/or crafting for charity. Click here for the main page of her blog.